Frame rate is capped at 30 FPS on 1.0 version; later updates removed that limitation. Steam license codes work on retail PC/Mac releases. Quake Wiki - A detailed wiki for every Quake game made. Splash Damage Editing Wiki - The official modding wiki for the game. Planet Quake - Very old hub for all Quake games. Has mods, guides, and news on the Quake communities. 2.1 Patches, Demo, Server, SDK, etc. No physical copy protection; online-play requires online account which asks license code. Simple disc check, no physical copy protection; online-play requires online account which asks license code. No longer available digitally. While Bethesda owns the rights and games based on id Software properties (such as Quake 4) are still on sale, it's still unavailable for unknown reasons. Patches, Demo, Server, SDK, etc. All official downloads available for the game can be found at the Splash Damage game downloads page. Open etqwconfig.cfg with a text editor. Set seta r_useThreadedRenderer to "2"
Enables native Alt+Tab ↹ and additional screen resolutions by translating SDL 1.2's calls into modern SDL 2.0 on Linux. Install libsdl2-2.0-0, libsdl2-2.0-0:i386, libsdl1.2debian, libsdl1.2debian:i386, libudev1, libudev1:i386 packages with your distro's software manager. Backup and remove libSDL-1.2.id.so.0 library in <path-to-game>. Download sdlcl-1.0-i686.tar.gz; extract libSDL-1.2.so.0 into <path-to-game>. Changing some video and voice settings might result black screen; return to desktop, exit and restart the game. ETQW Tweaker utility. 2.0.4 is the latest version. See the WSGF page for details. Open console with Ctrl+Alt+~ and use g_fov X (default FOV is 90° at 4:3). Partial audio translation backported from Quake Wars Online available. See Change language. Download ETQW Multilanguage Pack and follow OS specific instructions below. Edit seta sys_lang line depending on your language. Open etqw or etqw-rthread with a text editor in <path-to-game>. macOS port of ETQW supports only English, French, German, Spanish localizations. Follow "<path-to-game> > Enemy Territory QUAKE Wars.app; Right click; Show Package Contents > Contents > Resources" path. Find English.lproj, French.lproj, German.lproj, Spanish.lproj localization folders. Keep a localization folder in place depending on your language, backup and remove other localization folders. All new games need to be created externally. Custom maps require auto-restart which is prevented by Windows 10 since version 1703 (Creators Update). Linux version of the game depends on outdated version of glibc which causes crashes on modern distros. Replace game's libSDL library with SDL Compatibility Library (SDLCL). When the game hangs, freezes or crashes, return to desktop with Alt+Tab ↹ or "show desktop" shortcut of your distro. Kill etqw-rthread.x86 or etqw.x86 processes with system monitor of your distro, restart the game. Windows updates since early 2018 cause authentication interruption for new ETQW installations. Default high DPI scaling behaviour and fullscreen optimizations features of Windows 10 break the game's fullscreen compatibility. The game does not support directly switching to desktop by Alt+Tab ↹ or ⌘ Command+Tab ↹ on Windows and Mac. Set seta com_useFastVidRestart to "1". Open in-game console ~ or Ctrl+Alt+~. Switch to windowed mode Alt+↵ Enter. Go to the username/base directory in player profile(s) location. Open bindings.cfg with a text editor. Paste bind "F9" "toggle r_fullscreen; vid_restart" "" "default" at the bottom of the file. Open in-game console ~ or Ctrl+⌘ Command+~. Switch to windowed mode F9. In some occasions, accept or reject buttons for downloads might not be clickable. Open and close in-game console. EvenBalance has dropped support for ETQW. Check PunkBuster on top left corner of servers menu. Open the in-game console (Ctrl+Alt+~). Connect to the game servers. Mods require auto-restart which is prevented by Windows 10 since version 1703 (Creators Update). As custom maps require another auto-restart, this method will work only with vanilla maps. Vanilla game does not extract megatextures from custom maps. Install one of the mods that support megatexture extraction. Activate the mod in game's mods menu. As the megatextures are properly extracted, the map now can be played with vanilla game. Shortcut for console is Ctrl+Alt+~ unless com_allowConsole is set to 1 in etqwconfig.cfg file at the configuration file(s) location. The game requires ~ (Tilde) key to open in-game console that might not possible with some non-US English keyboard layouts with dead keys. Open etqw-rthread or etqw launcher script with a text editor. The game supports Advanced Linux Sound Architecture (ALSA) and Open Sound System (OSS) for sound; game's default sound architecture ALSA has compatibility issues with PulseAudio on modern distros. Open etqwconfig.cfg with a text editor in configuration file(s) location. In case of mods, etqwconfig.cfg file in the mod's directory should be edited separately. Set seta s_micDevice to "plughw:0" or "plughw:1". Set seta s_alsa_mic to "plughw:0" or "plughw:1". Set seta s_noMic to "0". TeamSpeak may block in-game VOIP on Linux; use USB microphone instead of on-board microphone. The game has compatibility issues with non-western localizations on Linux. 1.5 updater for Mac is not compatible with most recent releases of macOS. Download and mount v1.5 Full Update (macOS) from official downloads page. Follow "Enemy Territory QUAKE Wars 1.5 Installer > "Right click; Show Package Contents" > Contents > Resources" path. Open Archive.pax.gz with Archive Utility, a folder named tmp will be created in Downloads folder. Follow "tmp > AspyrLinkToGameFolder" path. 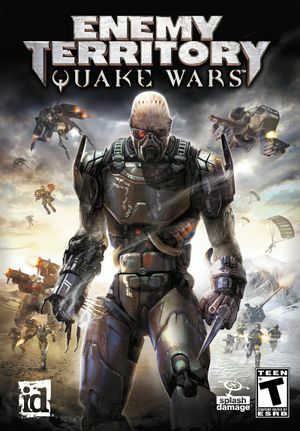 Copy and overwrite Enemy Territory QUAKE Wars.app and QUAKE Wars Dedicated Server.app to <path-to-game> directory. Copy and merge base folder in <path-to-game> directory; ⌥ Option + drag/drop. The game now can be launched via "<path-to-game>/Enemy Territory QUAKE Wars.app". The game does not work out of the box on case-sensitive HFS+ file system. After the initial crash, go to the configuration file(s) location; open game.so.bundle folder with Show Package Contents function. Rename contents folder into Contents and open it. Rename macos folder to MacOS. Same fix should be applied in mod directories. DirectSound, OpenAL Linux and Mac versions have only OpenAL which is optional for Windows. PunkBuster EvenBalance dropped PunkBuster support for ETQW (see: Issues fixed). 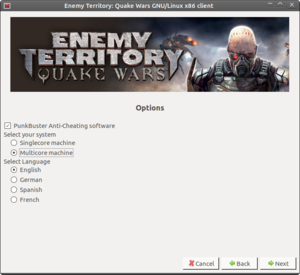 Linux version of the game requires retail PC DVD for installation. License codes and online accounts of retail PC, retail Mac and Steam version are compatible with each other; therefore Linux version can use license code and online account of retail Mac and Steam version. Select "Multicore machine" if your computer supports it; then finalize the installation. The existing retail PC, retail Mac, Steam version online accounts or license codes can be used with the retail Linux version. If you want to use the license code of the Steam version on Linux, enable Steam Play to view CD Key. Switch "Detail View" mode in Steam library. Click "CD Key" to view license code of the game. Launch the game with etqw-rthread or etqw script launcher. Consult enable multithreading, high frame rate, issues fixed and issues unresolved sections for further points. ↑ 1.0 1.1 1.2 File/folder structure within this directory reflects the path(s) listed for Windows and/or Steam game data (use Wine regedit to access Windows registry paths). Games with Steam Cloud support may store data in ~/.steam/steam/userdata/<user-id>/10000/ in addition to or instead of this directory. The app ID (10000) may differ in some cases. Treat backslashes as forward slashes. See the glossary page for details. This page was last edited on 13 April 2019, at 06:00.